When you ask anyone about the original leaders in the AR industry, the legendary name of Yankee Hill Machine comes up over and over and over. Yankee Hill Machine was founded way...way back in 1951 as a cutting edge machining facility focused on the four key values of quality, engineering, performance, and value. Yankee Hill evolved and grew with the AR platform offering a growing array of AR accessories around their values. Yankee Hill is heavily integrated into other custom AR manufactures as options to customize your rifle during the build phase. In fact it is nearly impossible to purchase a customizable rifle without being presented with at least one YHM AR upgrade accessory in the process. 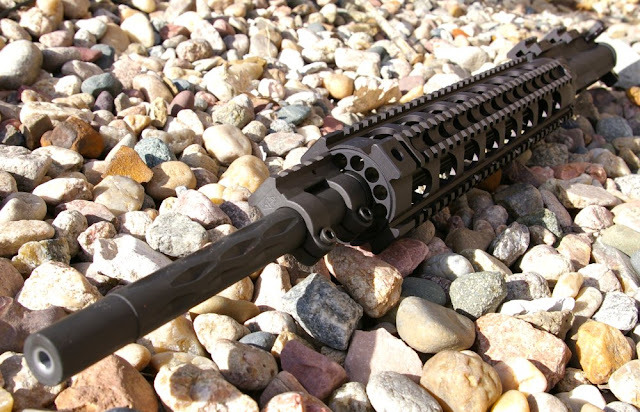 Today, Yankee Hill Machine not only offers one of the most expansive high quality AR accessory lines of any manufacturer, but also offers that same breadth and quality in standard and fully custom AR rifles, uppers, and lowers and renowned sound suppressors. Generally I have gravitated to 16”-18” barreled rifles, however I had been wanting to find a lighter weight 20” upper with a full rifle length gas system and landed on Yankee Hill’s site. It has been a while since I visited the YHM site and was reminded how expansive and unique their AR product line has become. Yankee Hill had just what I was looking for in their fully customized Lightweight 20” Upper in 5.56 Nato and then I added a front and rear set of their Q.D.S. Same Plane Sights for a great off hand shooting AR. Yankee Hill Machine has been noted extensively for their quality and this upper was no exception. The build is solid with quality Yankee Hill components used throughout. This is a lightweight 20” upper and when mounted with the YHM sights to the pictured Tactical Machining complete lower only weighed in at 7.75lbs which is a nice weight considering the rifle length billet forend and 20” barrel. As I recommend when shooting any picatinny railed forend, adding rail covers will greatly increase comfort and handling with un-gloved hands. My preference has been for the Lo Profile Blackhawk Picatinny Ladder covers which provide just enough coverage without any extra bulk of the standard covers I used initially. Shooting this upper is a lot of fun and more enjoyable to shoot than your standard carbine. Part of that is that the rifle length gas system reduces the recoil noticeably more than a carbine and mid-length system. The plain barrel’s report also appears quieter to the shooter and the rest of the folks on the line than ARs with flash hiders or muzzle brakes. Add these traits together you have a really pleasant shooting rifle. What I liked most about this YHM-7700-L is that it is already fully customized with some very trick YHM parts. 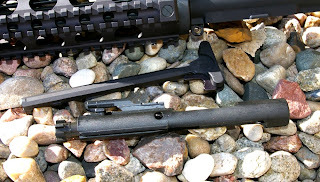 Yankee Hill starts with their “T” Marked Upper Receiver with forward assist, charging handle, and Mil-Spec Bolt Carrier Group that is spec’ed on all their rifles and uppers. The 20” barrel is fully chrome lined and available in either 1 in 9" or 1 in 7" Twist and I choose the 1:9 twist to stablize the 40Gr-55Gr rounds I plan on using with this rifle. 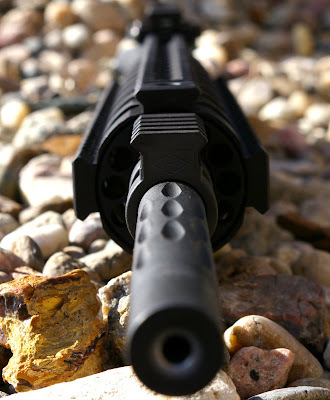 The barrel is non-threaded which drops a little weight and reduces overall length if a flash hider had been added. 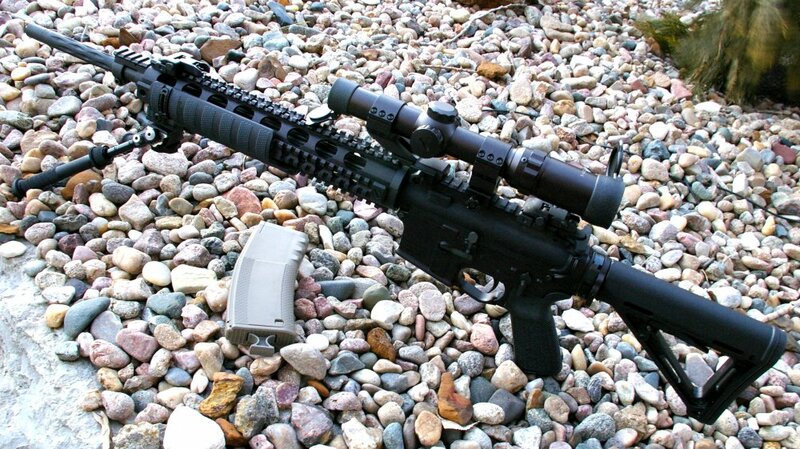 The result is a rifle that does not feel much longer than your standard AR 16" barrel + flash hider. Most hunters and target shooters will opt for a un-threaded muzzle due to less boom back on the shooter and potentially higher accuracy and honestly this would actually be a better home defense gun becuase of the apparent concussion reduction to the shooter. 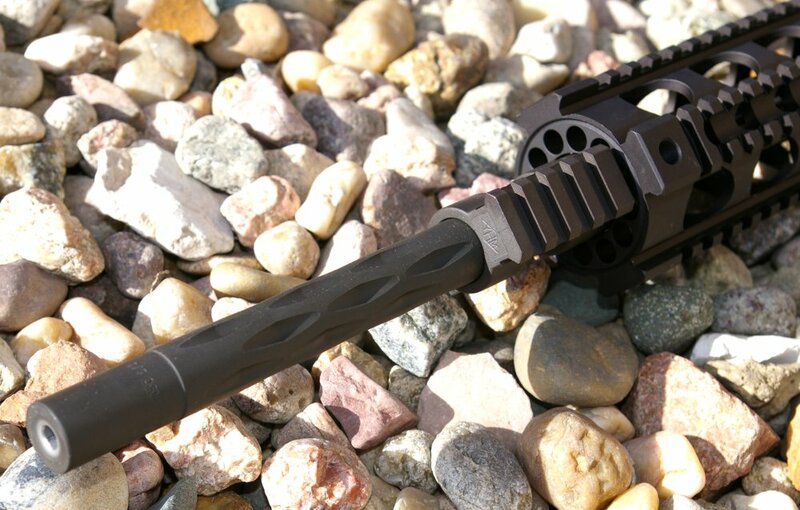 YHM has added a ton of functional style to the barrel with deep flutes before the gas block and the YHM Diamond Fluting up front to aid in barrel cooling and reduce weight. Probably one of the cooler looking barrels on the market and definitely a nice custom feature. The black stainless gas tube it matted to a YHM-9385A single rail gas block which accepts tall front sights or standard Same Plane sights with a YHM riser adapter. 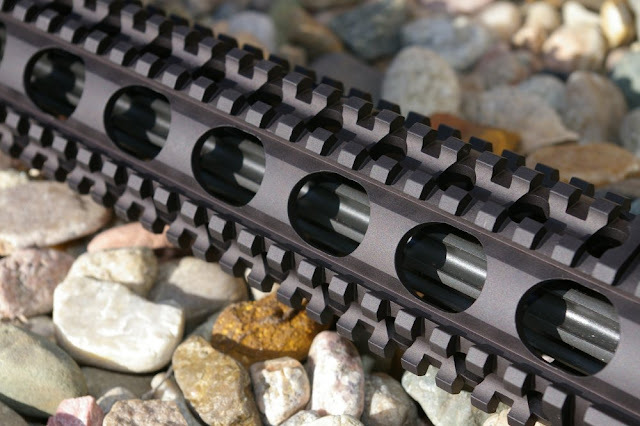 Covering the barrel is a YHM Rifle Length Lightweight Railed Handguard which provide about four feet of picatinny rail space for your accessories, but can be covered with any of the standard rail covers to increase comfort. With large holes throughout the handguard, it gives the opportunity to enjoy peeks at the awesome barrel fluting under the handguard and greatly reduces the weight of the long forend. The Yankee Hill Machine upper ran perfectly. 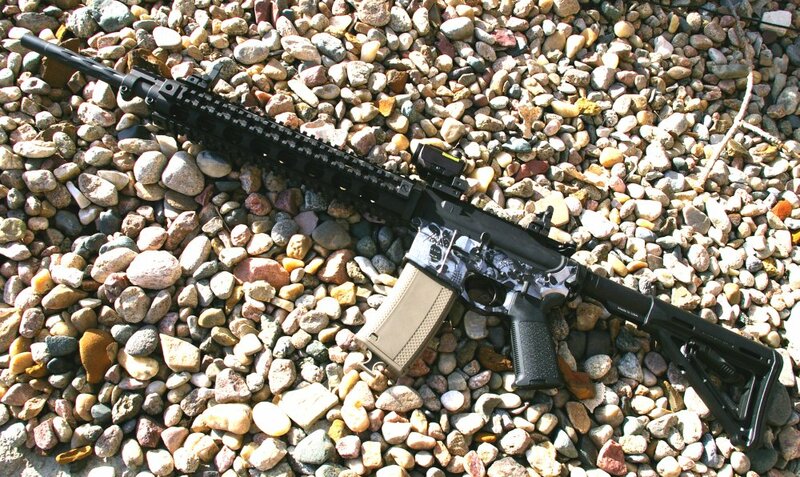 Fitting and functioning this upper to a wide variety of lowers diverse as a New Frontier Armory Polymer Lower, Black Rain Ordnance Billet Lower, and standard profile forged Tactical Machining lower were all problem free. 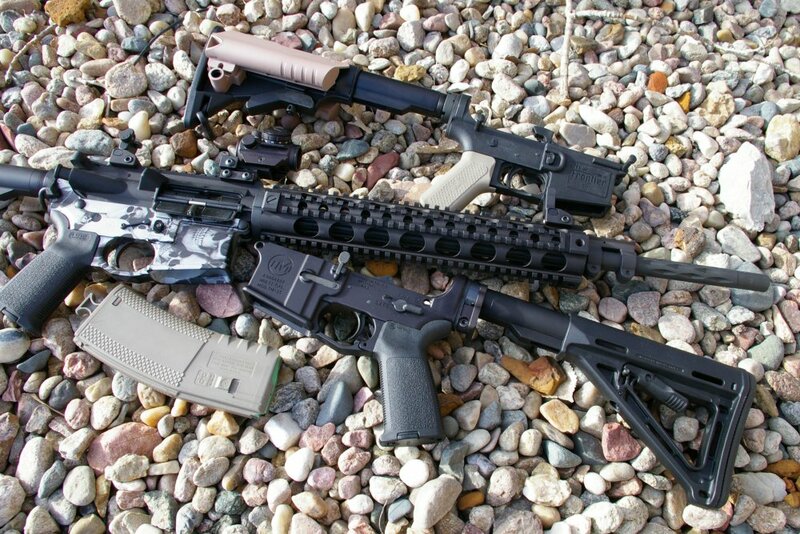 Let's see any other writer test out a upper with this array of lowers. Although I have not hit the 1000 round count yet, hundreds of various rounds netted no functioning, firing or feeding issues regardless of standard or heavy buffer lower receiver configurations. Another nice touch is that YHM includes two ½” picatinny risers on the upper which can be used for scope mounting or optics mounting. I used one of those risers and YHM’s front sight same plane riser to mount my Bushnell TRS-25 with a perfect co-witness to the flip up YHM Q.D.S. Same Plane Sights. Generally the TRS-25 is painful to find the right rise setup, however this worked perfectly with a 100% USA made product. When you start out zeroing on 25 Meter AR targets and nest a nice clover leaf with iron sights and $5.99 a box steel cased ammo, you know accuracy at 100 yards with a higher power optic and great ammo is going to be good. For accuracy testing I bolted up my trusty Simmons Predator Quest 6-24X scope and my Atlas bipod I use for all accuracy testing and hit the bench to see how the YHM-7700-L liked a diet of Hornady 5.56 NATO 55 GR GMX Superformance rounds. Beyond the break in and a lot of general plinking and shooting drills which put around 300 rounds through the upper, one afternoon of group shooting delivered six conscientiously shot groups of all under 1”. In fact three of the 5 shot groups were under .75” with the Hornady ammo which I consider excellent in my hands. My single best group of the day was a .65” five round group which is plenty accurate for my purposes. Slipping a Millet DMS 1-4x scope on in place of the high powered Simmons still delivered consistent sub 1” groups. 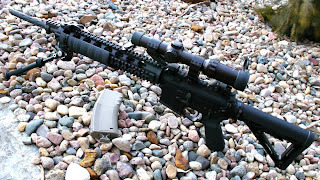 It is most likely this upper will ride with a 1-4 optic or with just light with the iron sights however this is one of those versatile iron sight or optic uppers where a quick release 10X scope that you could pop on and off would be the best option to take advantage of the accuracy for varmit hunting at a distance. It is the little things that make a good rifle great and those refinements take time to tune. Yankee Hill Machine has definitely learned a thing or two since 1951 about what makes great products and AR accessories both through listening to their customers and extensive in house testing. One of those details is continuing to deliver 100% USA made products. 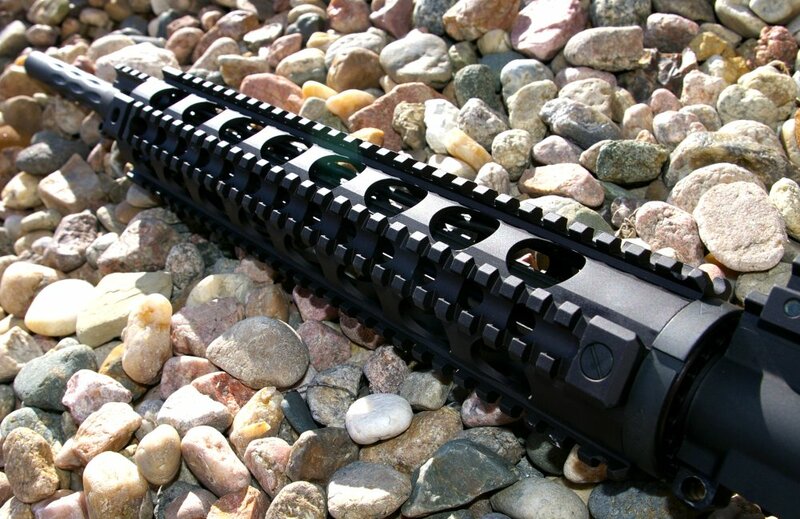 If I were YHM, I would do exactly what is executed in the YHM-7700-L Lightweight 20” Upper. They took all the best accessories and developed a feature rich set of products offerings. I was excited to write this review as this is something different than “here is another tactical AR”. Given the custom level of components, accuracy and features, Yankee Hill Machine has done a great job offering an affordable and unique lightweight upper to the market that is easy and fun to shoot all following their original founding values of quality, engineering, performance, and value. If you haven’t visited YHM’s site lately, I would suggest you pay them a visit. What you will find Yankee Hill’s site is a whole lot more than just AR accessories. Yankee Hill Machine, Co. Inc.